Do Uncooked Noodles Ever Go Bad? What Are Linguine and Fettuccine? 1 Do Uncooked Noodles Ever Go Bad? 2 How Long Is Fresh Pasta Supposed to Dry Before You Cook It? In addition to being the ultimate comfort food, pasta has the virtue of lasting longer than most other items in your pantry. Pasta packages are marked with expiration dates that indicate how long the manufacturer expects the product to be reasonably fresh. However, with proper storage, dried pasta can last years past its expiration date. 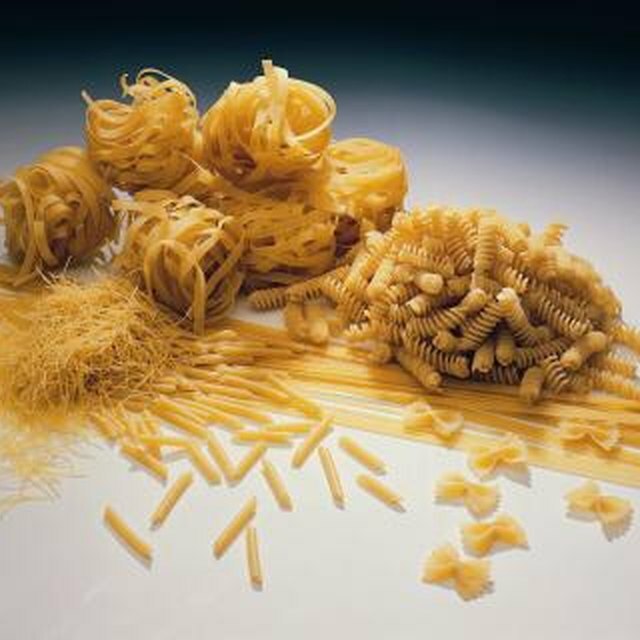 The shelf life of pasta ma also depend on how it is manufactured, such as whether it has preservatives and how much moisture it retains even after it's dried. Most American pasta is sold in sealed packages that keep the noodles reasonably fresh, at least until several years past the expiration date. However, once the original package has been opened, pasta can start to go stale and lose flavor unless you store it properly. An airtight container will keep your pasta fresh, although this attention to proper storage is not necessary if you will be eating your pasta within a few weeks of when you open it. Pasta occasionally spoils and acquires an off odor. If pasta in your pantry smells sour or strange, discard it. Although pasta spoilage is fairly unusual, it is not uncommon for dried pasta to attract bugs, especially if you store opened pasta without sealing it in an airtight container. Discard the package if you see grain moths or other bugs in your dried pasta. Even though pasta may not turn bad in the same way as milk or meat products, it does become less fresh, losing flavor over time even if it is properly stored. As it ages, dried pasta also loses some of its color, especially if it has been colored using natural colorings such as beet or spinach. Because these types of pasta are special mainly because of their visual appeal, this loss of color can detract from your enjoyment of them. Unlike dried pasta, fresh pasta goes bad relatively quickly. It will keep in your refrigerator for four or five days, or you can store it in the freezer for six to eight months. Fresh pasta that has spoiled may become discolored or moldy. Fresh pasta that looks OK may still have a spoiled, sour odor. Discard any fresh pasta that does not look or smell right. Fox News: How Long Does Food Really Last? Can You Use Musty Smelling Flour? If Flour Has Never Been Opened Can It Still Go Bad?